Review: Charles, a confirmed bachelor attends a series of weddings. He falls hopelessly in love with an American woman named Carrie. Carrie marries someone else so Charles decides to tie the knot with an old girlfriend. 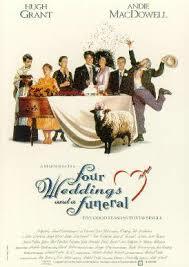 One of the best British comedy dramas. For one of the scenes Hugh Grant had to learn British Sign Language. This is Rowan Atkinson’s favorite film of his own. If you watched this now it does seem very old fashioned and dated. At the Golden Globe Awards in 1995 Hugh Grant won an award for Best Performance by an Actor in a Motion Picture – Comedy/Musical. At the Baftas this won three awards and they were for Best Actor (Hugh Grant), Best Actress in a Supporting Role (Kristin Scott Thomas) and for Best Film. Mike Newell won the David Lean Award for Direction. This is one of Barry Norman’s Greatest British Films. One film critic wrote “Most of the acting is first-rate, with special credit going to Grant as the hero and Simon Callow in a memorable supporting role”.